Lemon Sour Cream Pound Cake - Chocolate Chocolate and More! 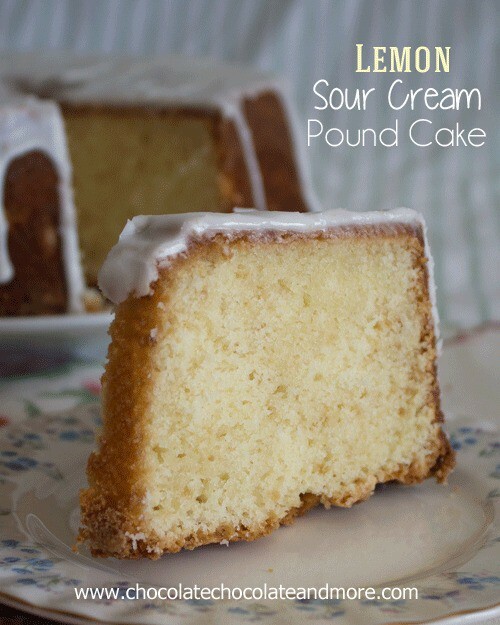 Lemon Sour Cream Pound Cake-a light lemon taste makes this a perfect sour cream pound cake. Last week I was all about Lime, this week it seems I’m going to be all about Lemon. I get in moods. I know we all get moody, cranky, happy, excited, yeah. But I’m talking about food moods. As much as I love chocolate, I can go weeks without even wanting any. I know hard to imagine but it happens. Sometimes my moods will go with the seasons, Summer time=fresh veggies. Makes sense, and also a good thing since I,m trying to get into a bathing suit or just walk around in shorts. I need to try and cut back on a few calories. Sometimes my moods are completely opposite of the seasons and it can get a little rough. Trying to find what I want in the store that is. Just the other day, I was wanting fresh strawberries. I thought, no problem. I had to go to Walmart anyway. Would you believe it, not a strawberry in sight! Completely ruined the shopping trip for me. I did pick up the other things on my list but they were all just excuses to go and buy my strawberries! Then, the following day, hubby and I went to Kroger, they had strawberries but they were terrible looking. I will be so happy when strawberry season finally gets here. We have the best U-pick place in the world. Hopefully, I’ll still be in a strawberry mood. That’s the nice thing about lemons, they always seem to be “in season” somewhere in the world. So you can get fresh lemons. Or you can get that big bottle of lemon juice and always have it on hand for when you get in a Lemon mood. This cake definitely satisfied my lemon mood. Not overly lemony, not overly sweet. A good pound cake. And while you could serve it without the glaze, let’s just say the glaze is the icing on the top. The perfect complement to this cake. Grease and flour a 16 cup tube or bundt pan. Sift flour, baking soda and salt together, set aside. In mixing bowl, beat butter until fluffy, about 5 minutes. add in sugar, one cup at a time and beat for another 5 minutes. Add eggs, one at a time, beating just to combine after each addition. Add in lemon juice and peel. By hand, fold in flour mixture and then add in sour cream. Make sure everything is combined but do not over mix. Spoon batter into prepared pan and bake in a 325 degree oven for 1 hour and 20 minutes. Test for doneness using a toothpick. Cool on rack for 15 minutes before inverting cake onto rack to cool completely. Once cooled prepare glaze, whisk together powdered sugar and lemon juice until smooth and a thick pouring consistency. Pour over cake and let set before serving. Looking for some other Lemony ideas? I love anything lemon, this is my kind of cake! 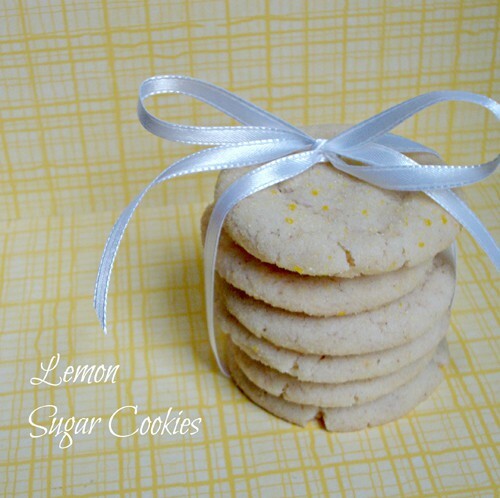 You can bake as many things as you want with lemon, I love seeing them! I NEVER tire of it! I’ve been on a lemon and lime kick myself lately! I think this will fill my Bundt pan perfectly. Delicious. I agree. It may be almost Easter, but not strawberry season yet. I am ready for all those good fresh fruits and veggies, though. Hubby likes Anything lemon so know he’s going to love this. I’m not a big lemon person either, but sometimes I’m in the mood for it too. Looks like a nice spring dessert! Lemon is one of my most favorite flavors Joan! You’ve totally put me in the mood for citrusy desserts! Wow, this looks yummy. I love recipes that contain lemons. I have always liked food with lemons, but when you have two lemon trees, you are always looking for new recipes. Two Lemon trees Bev? I’m so jealous! OH YEAH! Lemon pound cake is my favorite, and I had it for my wedding cake! 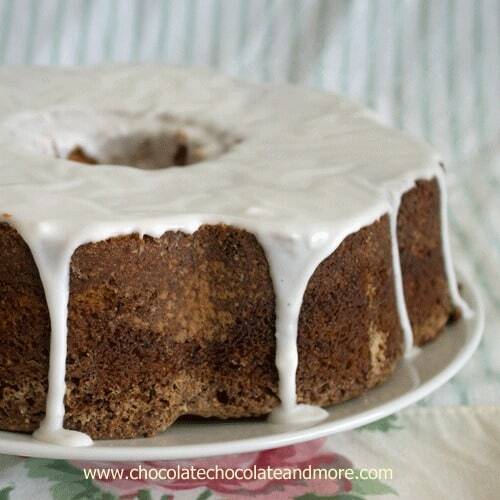 I love sour cream pound cake too, and I bet together it is AMAZING! Nothing can keep me away from a good lemon pound cake. Can’t wait to try this one. Yum! What a fun cake and perfect for Spring!! Lovin Lemon right now! I am trying this recipe soon! This is seriously making my mouth water (and my hips wider justt gazing at it) Very yummy! You’ve got me in a lemon mood now! Yes! More lemon. Keep the lemon recipes coming. 🙂 And I haven’t made a pound cake for years. I need to change this! Beautiful lemony pound cake! I know what you mean about waiting for strawberry season to arrive-love the sweet strawberries that don’t need sugar! Delish! Loving all of your lemon desserts! This one is amazing. Oh yes! 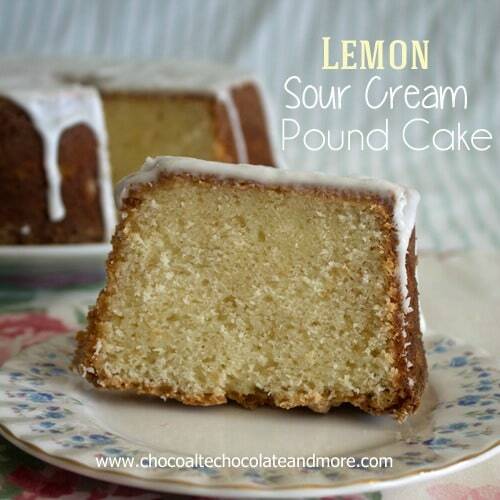 Lemon pound cake sounds wonderful. Thank you for sharing. I totally get food moods 🙂 And I’m ready for strawberry season too! This pound cake looks delish, Joan! I Love all the lemon! Thanks for sharing at Show Me Your Plaid Monday’s! Yum! I could totally go for a slice of this right now! I love this cake, Joan! It looks so good! Thanks for sharing at Marvelous Mondays! Pinned to my Food and Marvelous Mondays board! Love a good pound cake! Thanks so much for joining me at Two-Cup Tuesday at Pint Sized Baker. I hope to see ya again tomorrow night. I can’t get enough of lemon ideas. Your pound cake is perfect, Joan!